New York. 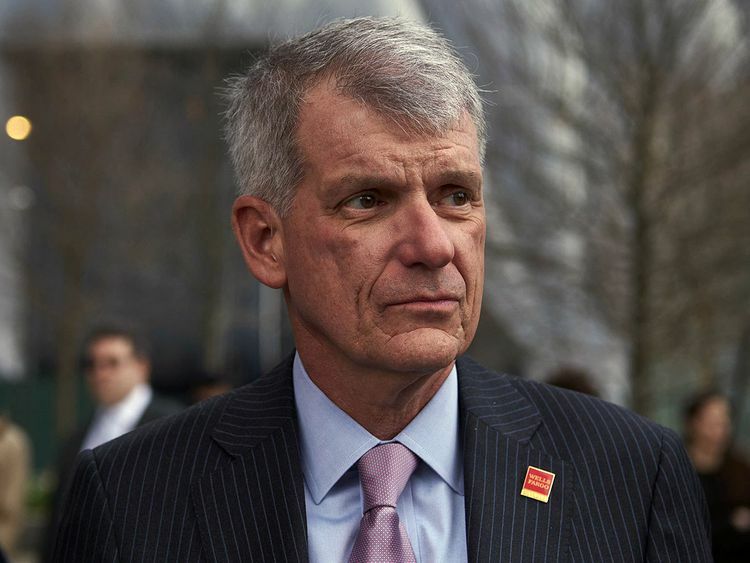 Wells Fargo & Co. Chief Executive Officer Tim Sloan gave in to critics and abruptly stepped down Thursday, after the 31-year company veteran struggled to tame a range of scandals, launching the fourth-largest US bank into a hasty search for a successor. Sloan, 58, will be replaced on an interim basis by the firm’s general counsel, C. Allen Parker. The board said it plans to look externally for a permanent replacement. The stock climbed in early trading Friday. Shares of Wells Fargo rose 2.2 per cent to $50.19 as of 7am in New York. They climbed 6.5 per cent this year through Thursday. On a conference call after the announcement, Sloan said he decided to leave because his presence was hurting the company. “It has become apparent that the focus on me has become a distraction that impacts our ability to successfully move Wells Fargo forward,” he said. He notified the board Tuesday, according to a regulatory filing. Chair Betsy Duke said the panel hasn’t yet spoken to any candidates. The search for a successor won’t be simple. Recruiters and investors have said the pool of plausible replacements is shallow and the job description daunting, especially with the company still embroiled in probes. Finding an external candidate groomed to run such a large bank probably means poaching from just a few peers, such as JPMorgan Chase & Co. Yet paying enough to pry someone from a more stable situation risks a firestorm with the same critics who called for Sloan’s head. In the meantime, Parker, 64, will be an unusual bank boss. He was a longtime lawyer for Cravath, Swaine & Moore LLP, one of Wall Street’s pre-eminent law firms, where he started in 1984 and was presiding partner before joining Wells Fargo in 2017. He was among more than 10 senior hires from outside the company as it sought to clean up its image. Bank of America Corp. was embroiled in legal fights almost a decade ago when it installed its former general counsel, Brian Moynihan, as CEO. He had also run the bank’s consumer and investment-banking businesses and remains at the helm. Sloan was promoted to the top job in October 2016, when John Stumpf stepped down amid intense blowback over the revelation that employees had opened millions of fake accounts to meet sales goals. Sloan overhauled the incentive system, travelled the country to meet staff and ousted managers. He aired commercials to apologise and launched a campaign, dubbed “Re-Established,” laying out the bank’s commitment to doing the right thing. Yet he struggled to make headway in improving the company’s reputation as additional problems emerged in other divisions, and as politicians, regulators and investors intensified their critiques. Last year, Wells Fargo was dealt an unprecedented blow from the Federal Reserve as then-Chair Janet Yellen’s final act: The bank can’t increase assets beyond their level at the end of 2017 until it addresses missteps to the regulator’s satisfaction. In January, the lender said it’s planning to operate under the cap through the end of 2019, rather than just the first half. In the meantime, it’s accruing billions of dollars in fines and settlement costs. That includes $1 billion last year to federal regulators for consumer mistreatment and $575 million to 50 states and the District of Columbia. Supporters including board members credited Sloan for unearthing and fixing past problems, tightening internal oversight and taking other steps to address regulators’ concerns and improve earnings. “I’m very empathetic to anybody that walks into a big problem at a very, very, very large and politically sensitive institution where you’ve got maybe 250 or so thousand people and the bad acts of one of them can reflect on you,” Buffett said Thursday in a wide-ranging interview with CNBC from a benefit luncheon in Texas. That pressure kept mounting. At his most recent appearance before the House Financial Services Committee this month, the panel’s chair, Democrat Maxine Waters, said he should be denied a bonus and fired. Then, as the session concluded, the Office of the Comptroller of the Currency issued an unusual statement, saying it continues to be disappointed with the bank. Fed Chair Jerome Powell also made a similar point this month, saying the company had “deep problems” and that the central bank wasn’t yet satisfied with efforts to address them. Analysts and investors will have to get to know Parker, who’s maintained a relatively low public profile while at the bank. He’s married with four children, likes golf, and wrote a master’s thesis on religious minorities in Pakistan, according to an interview posted on the bank’s website in 2017. In contrast, Sloan was well-known when he took the helm. He rose rapidly through the executive ranks after Stumpf became CEO in 2007, becoming chief administrative officer in 2010 and chief financial officer just five months later. By 2015, he was president and chief operating officer. He’s eligible to collect the remainder of past compensation packages but won’t receive a special retirement award, the bank said in its filing.